The third annual Sweater Week is happening from February 11-15 at the Abbotsford and CEP campuses. Temperatures will be slightly lowered in most spaces in an effort to reduce climate-changing carbon emissions. Sweater Week is a demonstration that you can be comfortable even with small reductions in indoor temperatures by layering up and dressing for the winter season. So, bundle up in your coziest sweater, enter the contests, and have fun being energy efficient! When we all come together and make small adjustments in our lifestyles, the results of our combined efforts can make a significant impact. 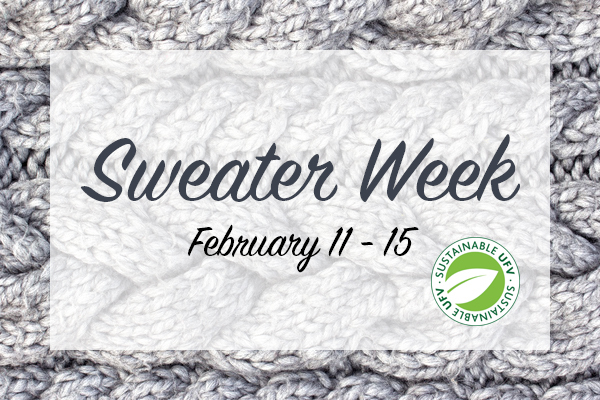 Snap a selfie while wearing a sweater; post it on Facebook, Twitter, or Instagram; and tag @SustainableUFV. Or email sustainability@ufv.ca! Keep an eye out for Sustainable Selfie Stations on both Abbotsford and Chilliwack campuses. Showcase your style, comfort, and commitment to an environmentally sustainable lifestyle. Daily and grand prizes from gift cards to bookstore credits, to sustainability packages, and more! Lots of prizes to be won for the most committed, best selfie, best group employee submission, and to all the daily winners!